It’s blossom time again in Nottingham! Join the conversation on the website to decide when it’s the right time to meet under the tree in Christ Church Gardens on Ilkeston Road, Nottingham. 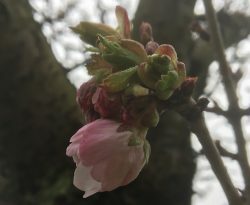 When This Tree Blossoms… is taking place as part of the Future Machine project, a series of meetings and interventions happening across England that take note of the environmental changes happening around us, linked by the presence of a mysterious machine. With financial support from the Mixed Reality Lab, University of Nottingham and Nottingham City Council. A collaboration between Frank Abbott and Rachel Jacobs, with support from Primary Studios.